"This Chapel is to the left of the entrance to Henry VII. 's Chapel, and accordingly gives us a general view from a point exactly opposite to that from S. Nicholas. 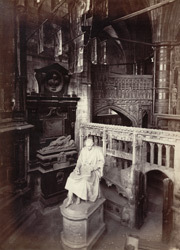 the Chapel contains some monuments of interest - among others, one of much beauty to Lewis Robsart, Lord Bourchier, standard bearer to Henry V., 1431, which forms the screen of the Chapel; a cinque cento tomb, with recumbent figures, Sir John Puckering, 1598; and a similar one to Frances, Countess of Sussex, founder of Sydney Sussex College, Cambridge, 1589. One of its most marked features is a colossal figure, seated of James Watt, from the chisel of Sir F. Chantrey."